Amp’d Athletics (Amp’d), formerly Jewels Cheer Gyms, is an organization providing All-star Cheerleading training to boys and girls. Our gym is located in Richmond, California. Amp ’d’s role in the community continues to be positive offering training in cheerleading and tumbling for its All-star teams and to other programs and schools in the community. As an extracurricular activity cheerleading and tumbling has increased in popularity in recent years and today’s cheerleading teams, at all levels, rely heavily on off-season training to keep its teams competitive in this ever growing sport. All-star Cheerleading is as an extracurricular activity has increased in popularity in recent years. All-star cheerleading programs have expanded to include competitions, community performances, and community service. Today’s All-star teams also rely heavily on fundraising activities and parents’ financial support to fund their programs. Amp'd is seeking sponsors for our programs. If you would like to be a sponsor, please contact us at ampdathletics1@gmail.com. Each All-star cheerleading performance is approximately 2 minutes and 30 seconds long and includes many different skills including jumps, tumbling, stunting, pyramids, and dance segments. The dance portion of a routine consists of choreographed high-energy dance moves. The routine is performed and scored against other competitive teams at various local, regional, national, and worldwide competitions. Tumbling includes, but is not limited to, gymnastic type skills such as cartwheels, walkovers, and back handsprings; the skills performed are determined by the skill level. Stunting is categorized by a group of two or more individuals that elevate each other or another cheerleader in the air. Some stunts include release moves and stunts may also be performed by one base with one flyer. Pyramids are a form of stunting that is done as a large group with interconnected moves. 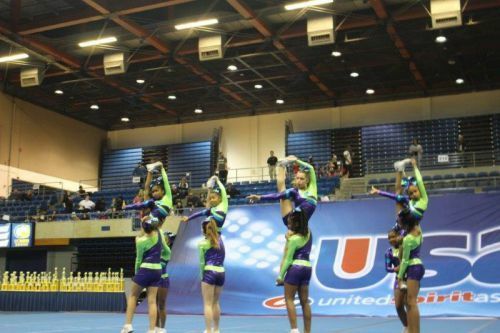 Like other programs for youth, All-star cheerleading provides an outlet for youth to participate in a meaningful activity, develop skills in teamwork, and improve self-esteem. These results are achieved when cheerleaders participate in a well-developed and implemented All-star Program as offered by Amp’d. Amp’d All-star teams include cheerleaders who may be of varying ages and/or may attend different schools. The team practices at our facility, specifically designed for performance and competition training located in Richmond, California. The term All-star does not mean cheerleaders must have extensive training; Amp’d sets its own guidelines and qualifications for participation. We accept children, ages 4-18, of all skill levels, ranging from beginning to advance. Students participating in our program learn valuable life lessons through their cheerleading experience that will prepare them for the world outside of school. Amp‘d’s coaches provide an avenue for experiential learning by providing a well-rounded program.